It's usually the case with electronics that the successor will improve upon it's predecessor and the Innotab 2 is no exception. 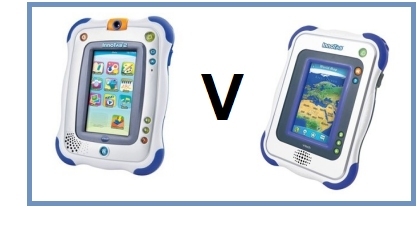 VTech analysed the competition (the LeapPad), listened to customer feedback and went about producing the Innotab 2. Built-In digital camera capable of both photo and video. This can be cleverly rotated to capture images both forward and backword facing. Previously kids had to use a Kidizoom camera to take photos which could then be transferred to the original Innotab. Built-In microphone to compliment the new camera to record sound with video. Additionally it can be used to control some of the new apps and games. Much greater onboard memory from 64MB of the first Innotab to 2GB of the Innotab 2. This is also upgradeable via the SD/SDHC card slot which will accept cards of up to 16GB. Augmented Reality brings games to life using the built in camera, which allows kids to interact with game characters that are superimposed onto real surroundings and displayed on the screen. Cosmetically the Innotab 2 looks a lot more sleeker and smarter. The recommended age range has also changed to 3 to 9 year olds (the original Innotab was 4 to 9 year olds). All apps and cartridges previously purchased for the original tablet will also be compatible. All in all we think VTech has vastly improved upon what was a already very good product.